The event was well supported by local residents and visitors alike, who enjoyed a selection of scrumptious Easter fayre including hot cross buns and homemade cakes. Fun activities kept visitors of all ages entertained and included guess the weight of the sweet hamper. Visitors also had the opportunity to browse a range of stalls selling gifts, crafts and Easter items ready to be snapped up in time for Easter. Guide Dogs for the Blind also had a promotional stall. A fabulous luxury hamper was raffled off and won by supporter Val Jenner. Homecall is a home visiting scheme for blind and partially sighted people living in Bexhill. Scheme manager Leah Norman said she was delighted that the Fayre went so well, adding: “Pendragon Parties kindly donated an Easter Balloon display which brightened the hall and was raffled off. “Bizzy Fingers, a group of creative ladies who use their craft and skill to raise funds for charities, kindly donated their takings for the day to Homecall. 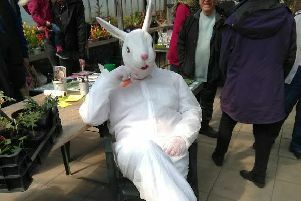 “This was a wonderful event with Bexhill charities coming together in order to make our Easter Fayre a resounding success; £1164.21 was raised for the charity. “Special thanks to our supporters Vernon and Kathy Findlay for their hard work in making craft items.